Even though Blackjack Video is a video version of blackjack, the rules followed are fairly standard. The dealer will always stand on 17. You can split any equal-value cards, but you cannot re-split. Split aces take only one more card, and if they take a ten-point card, you get 21 rather than blackjack. Doubling down happens as usual on any two-card total, even after a split. You can buy insurance, but if you’re playing against 50 hands, it can be expensive since they all have the same up card! There is no option to sSurrender in this game, so do be careful. Also note that all bets push on the event of a tie. You can play 1, 3, or 5 hands at a time in Blackjack Video. These hands can be played against 3, 5, 10, or 50 dealer hands. Every dealer hand you play against has the same up card, but will have a different outcome in the end. All player cards, and dealer up cards, are drawn from the same 8 deck shoe. The remaining dealer cards are drawn from one 8 deck shoe per hand – that is up to 400 decks. This unique situation lets you use the same strategy you would in any standard blackjack game – just treat each of your hands as a single hand in an 8 deck game against whatever card the dealer shows! Things get a bit confusing with the wager system in Blackjack Video, so pay attention. The amount you choose depends first of all on how many dealer hands you play against. If you play against 50, your bet can be from $0.10 to $50.00 per game result, and if you play against 3, 5, or 10 dealer hands the bet range is $0.25 to $50.00 per game result. The number of game results in a single round is determined by (player hands x dealer hands) – for example, if you play 3 player hands against 10 dealer hands, there are 3 x 10 = 30 game results, so your bet is multiplied by 30. Payouts are determined on a per-hand basis. Each one of your hands is compared with each one of the dealer’s hands. The total winnings are then tallied and displayed at the bottom. 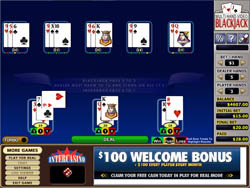 You can also see the results of each hand below the cards on the screen – whether it is a win, push, or loss. Payouts are 3:2 for blackjack, 2:1 for insurance and 1:1 for other wins. Watch the amount you are betting very closely, and remember that the actual amount drawn from your account when you deal might be much more than that, depending on how many hands you are working with. You don’t have to do the math yourself thankfully, you can just look along the right hand side of the screen under the heading initial bet, it will show you how much you are actually wagering. This can be as high as 12,500, so again, take care when betting with this game! Blackjack Video by Cryptologic is a powerful game, which has the potential to provide you with huge payouts if you are playing wisely. Like we mentioned above, you can treat each hand like a separate round of 8 deck blackjack, and act accordingly. When you get lucky enough to hit a blackjack against 50 hands, you can get paid out big amounts. This game doesn’t pay out more than any other, but it pays out a whole heck of a lot faster, so if you know what you are doing, download it and start raking in the cash!